Cakes are a hobby of mine. I love the clean and crisp look of a fondant cake, and with the quality of Duff fondant (affiliate link), I actually like the flavor too. I wanted to make a simple pink butterfly cake to go with my daughter’s sixth birthday theme. I was going for a bright pink and white look with a simple design. This was actually one of the easier cakes I’ve ever made, and I’ll show you how it is done. After covering with fondant, the cake took minutes to decorate. If you want to see more of the design elements and tutorials for the butterfly birthday, you can check out our folded butterflies, Tree Top butterfly pouches, chocolate butterfly pretzels and DIY butterfly invitations. If you are new to cake decorating, the simplicity of this design might be super appealing to you. Cake making is a only hobby of mine, but I really enjoy the art. You can see some of my other cakes under my cake tab. If you would love to decorate cakes too or are inspired to start, you might really enjoy my Cake Making 101 and Cake Making 201 posts that give you some of the cake making basics and my best tips and tricks. 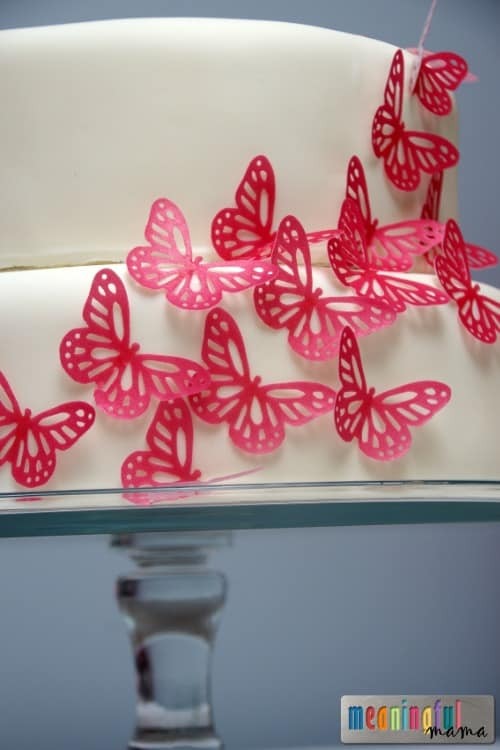 The key to making this cake was the rice paper butterflies. I found mine at an Etsy shop. She has a variety of rice paper cake decorating options. There are other options on Amazon too. Here is one example. Just type in “rice paper butterflies” to see the other possibilities. This is a beautiful vintage butterfly in a paler pink. I love the lace look, but you can find more solid designs too. 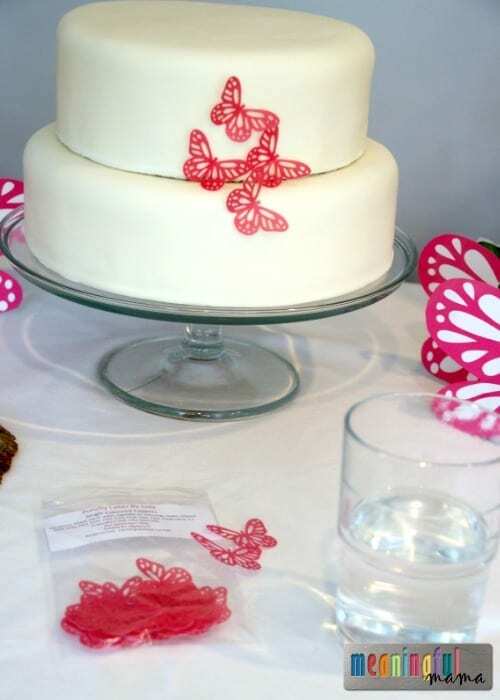 After putting a layer of white fondant, you adhere the butterflies with a little bit of water brushed on the center of the rice paper butterflies. 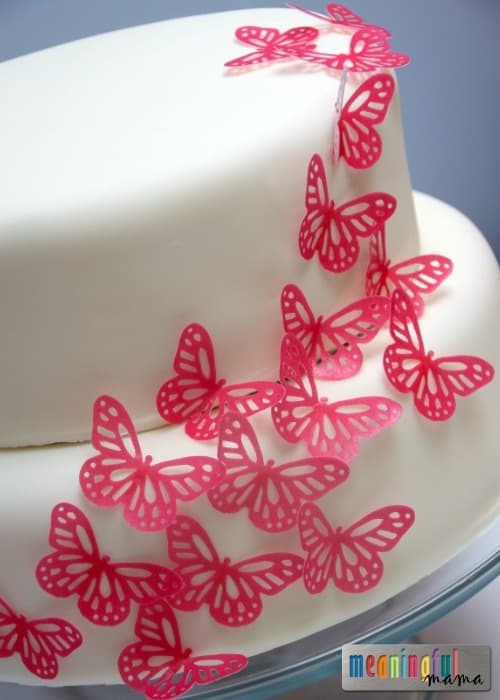 I had my butterflies swooping up the side of the cake. 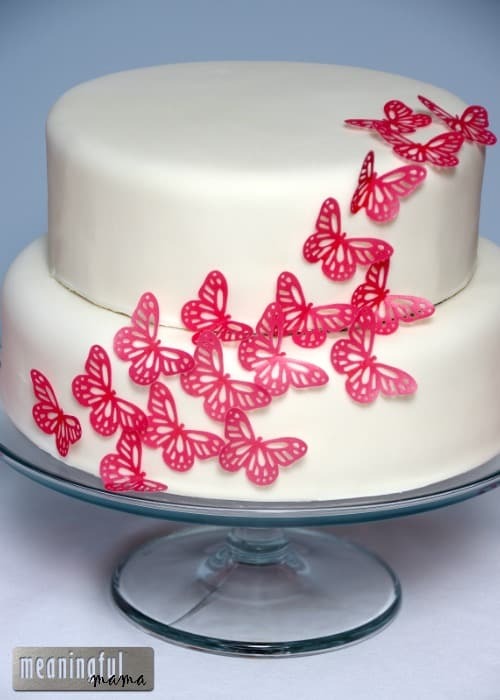 For all of you current and future cake decorators out there, I hope this fragile, lace butterfly cake has been an inspiration for you own decorating pursuits.